In the wake of Wednesday’s church shooting in Charleston S.C. — which killed six women and three men, including a state senator — other flags were lowered to half-staff, but the Confederate flag was not. “Guess it struck this thug as somehow inappropriate,” said Patrolman Lindsay “Lins” Dill, one of the first police officers to respond to the assault on the flag. All agree that this was a serious violation of state law. 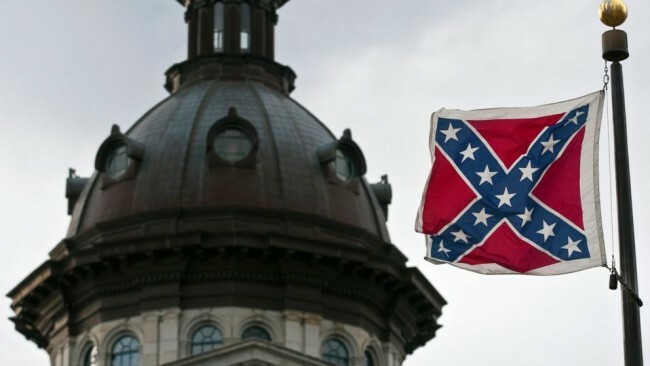 The Confederate flag is uniquely protected: The Charleston Post and Courier points out that “its status is outlined, by law, as being under the protected purview of the full S.C. Legislature, which controls if and when it comes down.” Unlike the other flags, it is not on a pulley, so cannot easily be lowered to half-staff; and State Senator Vincent Sheheen (D) notes that its privileged position at the top of the flagpole is ensured by a padlock. The National Rifle Association issued a response to the incident, pleading for “reason and calm.” They stressed that “guns are not brought into the world to commit this kind of crime,” and restated their familiar position: “Guns do not shoot flags; people shoot flags.” A local NRA representative, Scotty Wooten, acknowledged grudgingly that “the perpetrator had some skill with a rifle.” Apparently the sniper dispatched the flag with only two shots, one of which went straight through the body of the padlock. “Yeah, well that boy may be some kind of sniper, but he ain’t no American Sniper,” said Myron “Alma” Butts, a local gun dealer, who fought tears as he gazed up at the injured flagpole. Jeff Janulis, This is Not a hoax and not satire- The original story is from the Huffington Post which is not a satire news source.